There are many formulations of artificial tears on the market today. Systane is one of the best for its superior lubrication. This drop should be used 3-4 times a day. It is intended to supplement your own natural tear production. This product is used to treat eyelid inflammation. When the eyelids become inflamed, the oily glands around the lids become blocked and stop secreting oil into the tears, creating a thin, dilute, poor quality tear film. An inadequate tear film evaporates quickly, contributing to your dry eye. Sterilid contains a naturally occurring liquid (Linalool) distilled from plant oils that is widely used in personal care products for its floral scent. Linalool has been formulated into Sterilid to create a “gentle-on-the-eye” eyelid cleanser yet, with its pH-matched-to-skin formula, helps to maintain the skin oils that have antibacterial properties and provide the skin with a natural defense. 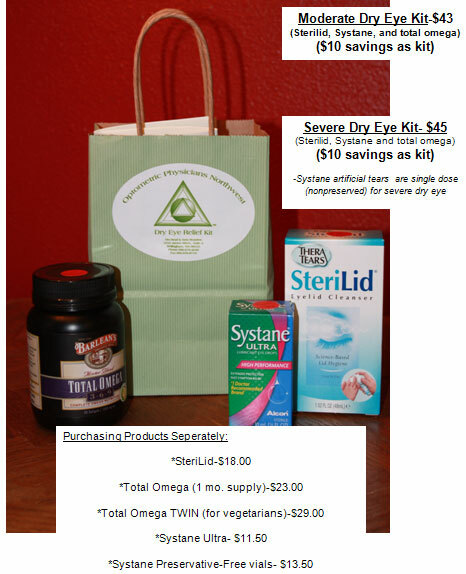 Omega 3’s are an excellent supplement which will aid in increasing your own tear production. Fish and Flaxseed oil work together by decreasing inflammation, stimulating tear production, and providing a higher quality tear film by improving the oil layer of the tear film. It is derived from fish, flax seed, and borage oil, providing you three valuable sources to help your dry eye. It is ultra purified form of fish oil to minimize mercury and other toxicities. It has a great, non-fishy taste, lemonade flavored. Burn fat faster and reduce excess body fat at the fastest possible rate.